LONDON--(BUSINESS WIRE)--Technavio analysts forecast the global cerebral palsy treatment market to grow at a CAGR of over 5% during the forecast period, according to their latest market research report. The growth momentum of the market is expected to accelerate in the year-over-year growth. Increasing cerebral palsy research is one of the major trends being witnessed in the global cerebral palsy treatment market 2019-2023. Research is being conducted to reduce the prevalence, understand the etiology, and find the best curable therapy for cerebral palsy. Various research bodies are providing federal funding for cerebral palsy research. Research is also being conducted on stem cells as a promising treatment option for various CNS disorders, including cerebral palsy. The research on the disease is increasing significantly. This is expected to lead to the development of a cure for cerebral palsy during the forecast period. The awareness about the management and treatment of cerebral palsy is increasing across the globe. March is the cerebral palsy awareness month. Many patients care organizations, such as the International Cerebral Palsy Society, work throughout the month to educate and spread awareness about cerebral palsy through social media, funds, and campaigns. Efforts are also being made to encourage researchers to work toward improving the lives of patients. The global cerebral palsy treatment market research report provides market segmentation by product (anticonvulsant drugs, antispastic drugs, anticholinergic drugs, NSAIDs, antidepressants, and others) and by region (the Americas, EMEA, and APAC). It provides an in-depth analysis of the prominent factors influencing the market, including drivers, opportunities, trends, and industry-specific challenges. The Americas held the largest share of the market in 2018, accounting for more than 50% share. It was followed by APAC and EMEA respectively. The dominance of the Americas can be attributed to the rising incidence of cerebral palsy and increasing awareness about cerebral palsy. 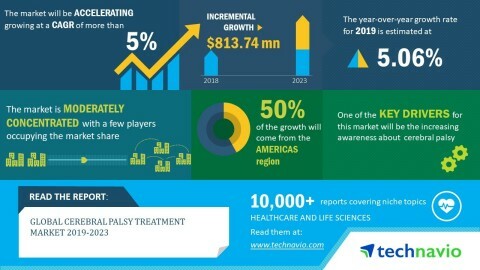 Technavio analysts forecast the global cerebral palsy treatment market to grow at a CAGR of over 5% by 2023.